On April 12, MISSING LINK will reveal a hilarious chapter in human evolution. The film features Hugh Jackman as the voice of a renowned explorer and Zach Galifianakis as Mr. Link, a huge ape-like creature the adventurer discovers in the Pacific Northwest. The animated film comes from Laika, the studio behind CORALINE and KUBO AND THE TWO STRINGS. Laika’s stories are told via stop-motion animation, in which real puppets are repositioned slightly from one frame to the next to create the illusion of movement. They have real sets and costumes, all made by hand, and they create the feeling of stepping into a whole new world. 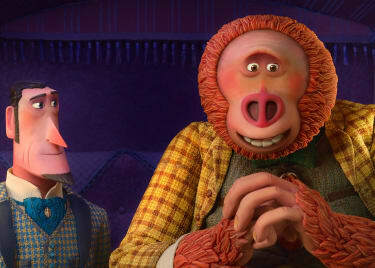 Here’s how Laika makes incredible animation like MISSING LINK. 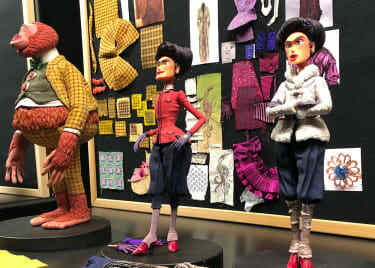 Laika’s studio in Oregon is filled with an amazing collection of workshops and stages. Puppets are made from a combination of specialized materials and consumer objects. (In PARANORMAN, for example, Norman’s shoes were made from leather taken from white gloves.) The main space is a warehouse subdivided into small areas by black curtains. Behind each set of curtains is a little glimpse of magic — a whole neighborhood street or an underwater landscape built in 10 or 20 square feet. Stop-motion animation is one of the oldest filmmaking techniques. Few animators, however, rely on stop-motion today. It is incredibly time-consuming, for one. And stop-motion requires building everything as actual physical objects — all to the proper scale. Digital objects also have to be designed and modeled for CG animation, but that process takes far less time. Beyond anything else, stop-motion is a specialized skill that takes practice. Laika has a refined filmmaking method. The process is constantly evolving, so the company’s method is the result of more than a decade of development. Everything Laika has done in the past contributes to making the next project better. Without making the fur for Monkey in KUBO AND THE TWO STRINGS, Laika could not have made the big, hairy Link. So, how does Laika do it? 3D printing is a big part of their approach. See, each character is a puppet, typically anywhere from 6 inches to 2 feet tall. A metal skeleton embedded inside allows movement, with flexible body materials, costumes and hair on top of that. Each puppet’s face is made of solid material, and each frame of the film — 24 per second — might require a different face plate. They call it “replacement animation.” (This 2012 video explains more, though the company uses some different printing processes now.) So, it takes thousands of faces to animate a movie. Every puppet has to have a whole variety of face plates to represent different mouth movements. In this case, “a whole variety” is a lot. For PARANORMAN, there were 40,000 faces printed. For KUBO, the title character alone had more than 20,000 face plates. MISSING LINK has over 100,000 faces! Laika does as much animation as possible “in camera,” which means most of the work — even amazing reflections in water — can be made with real physical objects. But computer animation is used to erase support structures and wires and to combine elements of some shots. Animators also plot out and model all mouth movements and face plates for each puppet using digital tools. Even with computer assistance, the underlying materials are all still there. 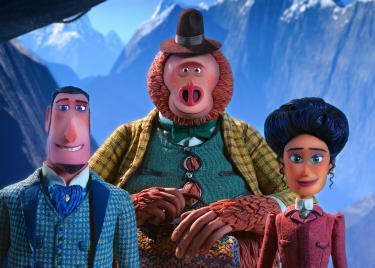 In MISSING LINK, Hugh Jackman’s character, Sir Lionel Frost, isn’t digitally “dressed” in a suit — he’s actually wearing a cloth suit. There are real sets and real light that you could see if you were standing on one of those little Laika warehouse stages. It’s a beautiful combination of handmade analog and digital polish. With all of the building the company has to do for each film, it shouldn’t be a surprise that Laika takes time before setting things in motion. They’ll work on a script and story for years before even beginning animation. Pixar and other CG animation companies can refine stories as they animate. Because of the number of physical pieces they have to build, Laika has to completely lock the script before animation begins. Laika’s past movies have proven how well their process works. The peerless stop-motion animation techniques and unique character designs are matched by great stories that are unlike anything else on the big screen. We can’t wait to see what MISSING LINK has in store. 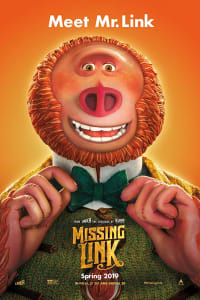 MISSING LINK opens at AMC® on April 12.